The egg cartons are especially designed for transporting different types of eggs. The cartons have the dimpled foams. These dimpled foams enable easy storage of the eggs and also protect from external shocks for a long interval of time. The primary use of the egg cartons is for packaging purpose. The egg cartons are commonly made up of plastics which include recycled paper or polystyrene .The egg cartons are witnessing high demand on the account of growing demand from the poultry products. The global egg cartons market is anticipated to expand at a significant CAGR of 6.0% during 2018-2027. The increasing poultry farming across the globe is anticipated to increase the demand for the egg cartons across the globe.The global egg cartons market can be segmented on the basis of number, material, alignment, size and region. On the basis of number, it is sub-segmented into 3 egg cartons, 6 egg cartons, 12 egg cartons and 24 egg cartons. 12 egg cartons is anticipated to be the largest sub-segment of the number segment. The large production of the 12 egg cartons is anticipated to be the primary reason for the growth of the sub-segment. On the basis of material, it is sub-segmented into plastic egg carton and paper egg cartons. On the basis of plastic egg cartons, it is segmented into polystyrene foam and clear plastic. On the basis of paper egg cartons, it is sub-segmented into recycled paper and molded pulp. Recycled egg carton sub-segment is anticipated to be the largest sub-segment of the paper egg cartons segment. The low cost of the recycled paper enables large usage of the cartons for the egg carrying purpose. On the basis of alignment, it is sub-segmented into vertical egg carton and horizontal egg carton. On the basis of size, it is sub-segmented into egg cartons for hen, egg cartons for ostrich and egg cartons for duck. Egg cartons of hen are anticipated to lead the size segment during the forecast period. The large prevalence of hen coupled with easy availability of the egg of the hen across the globe is anticipated to be the primary reason for the growth of the global egg cartons market. The increasing demand for packaging solution from food and beverage industry is anticipated to be major growth driver for the global egg cartons market during the forecast period. The recyclable material used for the egg cartons is of very low cost which in turn fuel the market growth of the egg cartons worldwide. The easy carrying of the eggs coupled with the lightweight of the egg cartons provides maximum functionality. Thus, it is anticipated to be a major growth driver for the global egg cartons market. The innovative developments in the design of the egg cartons reduce the cost of storing and transportation which is estimated to upsurge the demand for the egg cartons. 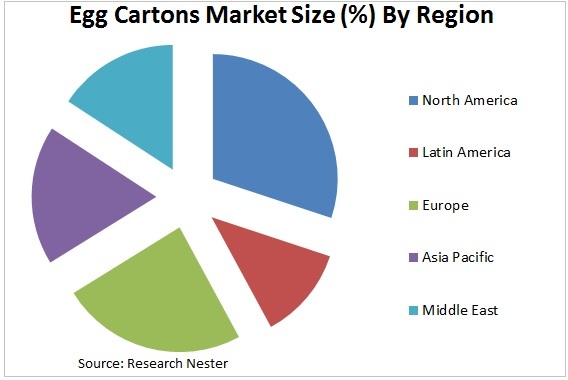 However, fluctuating prices of the raw materials coupled with high competition in the companies operating in the egg cartons is anticipated to be major factor restraining the global egg cartons market during the forecast period.